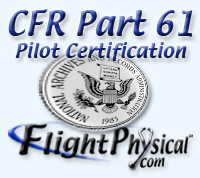 CFR 61.45 Pilot Certification - Practical tests: Required aircraft and equipment. § 61.45 Practical tests: Required aircraft and equipment. (ii) Has a current standard airworthiness certificate or special airworthiness certificate in the limited, primary, or light-sport category. (iii) A military aircraft of the same category, class, and type, if applicable, for which the applicant is applying for a certificate or rating. (iv) Cockpit and outside visibility adequate to evaluate the performance of the applicant when an additional jump seat is provided for the examiner. (2) An applicant for a certificate or rating may use an aircraft with operating characteristics that preclude the applicant from performing all of the tasks required for the practical test. However, the applicant's certificate or rating, as appropriate, will be issued with an appropriate limitation. (c) Required controls. An aircraft (other than a lighter-than-air aircraft) used for a practical test must have engine power controls and flight controls that are easily reached and operable in a conventional manner by both pilots, unless the examiner determines that the practical test can be conducted safely in the aircraft without the controls being easily reached. (2) A device that prevents the applicant from having visual reference outside the aircraft, but does not prevent the examiner from having visual reference outside the aircraft, and is otherwise acceptable to the Administrator. (3) Proficiency of the applicant can be observed by an examiner who is in a position to observe the applicant.